Big announcements for Lodi and Elk Grove on consecutive days. Could it be a harbinger of things to come for the Northern California Mega-region? NEC seems likely to build a significant manufacturing facility near the Elk Grove "ghost mall". Sac Bee story... Elk Grove officials have signed a tentative deal with a Bay Area tech company to bring 2,500 manufacturing jobs to the city. Mayor Gary Davis said the possible deal is with NRC Manufacturing, a circuit board maker in Fremont that has worked with Apple. Sac Business Journal story... 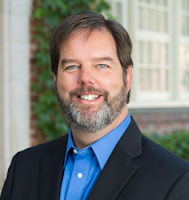 The deal could establish Elk Grove as an affordable place for technology companies to scale up manufacturing that has been developed in Silicon Valley, said Barry Broome, CEO of the Greater Sacramento Area Economic Council. He helped get the deal rolling by meeting with NRC officials in Fremont to pitch Elk Grove as a location. With Apple's nearby plant, which recently began an expansion, "now you have a situation where you start to create a trend," Broome said. Elk Grove has 165,000 residents and only 45,000 jobs, Davis noted. The recruitment is especially significant for a city known for years as a bedroom community that also bore a disproportionate hit during the 2008 mortgage crisis. NRC Manufacturing employs just 18 people in Fremont, where it operates in a 12,000-square-foot site. But the company plans to shift from manufacturing prototypes to a full-scale manufacturing operation. And a Sunnyvale based biotech firm investing and expanding in Lodi. Cepheid, a Sunnyvale-based producer of medical diagnostic products, is expanding its Lodi manufacturing operation, looking to grow to about 500 employees in two to three years from the current 230 workers, the company and area business officials said. With its existing facility at 225 N. Guild Ave., Cepheid purchased two buildings to the south on Guild Avenue that have been vacant since 2008 when Blue Shield left to occupy its new facility in south Lodi. Those include a 40,000-square-foot building to be used for manufacturing, essentially an extension of production now done in Sunnyvale, and a 32,000-square-foot building to be used for administrative offices, meetings and training. Can Modesto and Stockton help each other improve? Kevin Valine's recent column in the Modesto Bee highlighted a few issues that got me thinking about Modesto and Stockton. First, in yet another dubious ranking,* Valine reports that U.S. News ranked Stockton and Modesto 98th and 99th respectively in their ranking of the best places to live among the 100 biggest "U.S. cities" (actually metro areas). Second, he discusses a city financed consultant report studying the feasibility of reestablishing passenger service to the Modesto airport. How can the cities of the North San Joaquin Valley improve their economies and quality of life? There is no silver bullet strategy, but one approach that we have been advocating in the Center for Business and Policy Research is more cooperative action on a regional level in 3 areas: marketing, infrastructure, and education/workforce development. The struggles of the Modesto airport highlights one example of where a regional approach to infrastructure could make sense. Cities in the region are struggling financially, Stockton has just left bankruptcy and Modesto is also dealing with serious fiscal issues and cutting basic services. The Modesto airport is owned by the city and is losing money for a City with serious budget problems that has resulted in cuts to police staffing and other services. There are several airports within a 30 minute drive of Modesto with longer runways and better freeway access that are also working to reestablish hub passenger service (most notably Stockton airport, which is owned by San Joaquin County, which has been successfully adding discount passenger service and recent expansions in cargo). It seems to me that it would be more productive for the cities and counties in the region to work together towards the goal of regional air service. While the Modesto has long enjoyed some passenger air service, it may be time for them to start thinking out of the box. Perhaps they should evaluate alternative uses for the airport property that would make a fiscal contribution to the City and explore partnerships with other Counties and Cities in the region to develop convenient passenger air service. This is just one opportunity for regional action. Economic development entities in the 3 counties have recently engaged in some cost sharing for joint marketing activities in the Bay Area. The proposed expansion of ACE rail to Modesto and Merced is another important regional transportation infrastructure project. I expect we will see more regional action in the future. *The only place ranked below Modesto was San Juan, Puerto Rico. Of course, it is easy to complain about the methodology of a best places to live ranking that does not include climate data. While I think Modesto and Stockton have more to offer than these rankings suggest, there is no arguing that there are problems here. What does Westlands SEC penalty mean for the delta tunnels plan(aka WaterFix)? Last week, the SEC found Westlands Water District was misleading bond investors, making Westlands only the second municipal bond issuer to ever pay a penalty to the SEC. Bond rating agencies immediately placed Westlands' bonds a negative outlook. I am hardly the only one to come to this conclusion. Even WaterFix supporters openly acknowledge that the agricultural contractors might not be able to pay, even as they keep telling urban households that the tunnels will cost them $5 per month, a calculation that depends on the assumption that farmers pay the majority of the tunnels' cost. If the farmers drop out of the plan, these household costs are likely to triple. While I have been continuously skeptical of agricultural districts ability to pay, I was surprised by the SEC fine. It shows the situation was even worse than I thought. Even for a relatively small amount of bond debt, Westlands had to resort to "Enron accounting" to boost their revenue in a drought. So what now? It should be clear now that a proportional cost allocation isn't going to work. The Central Valley Project (mostly farmers) may even have to drop out completely, leaving the State Water Project (mostly urban agencies) to attempt financing the tunnels themselves. The Metropolitan Water District has discussed a "subscribed capacity" model as a potential solution to the cost allocation problem. In this approach, individual water agencies would choose how much of the tunnels' capacity they want to pay for - allowing some districts to opt out entirely and others to pay a larger share in return for a larger share of the tunnels' benefits. Although the details are unclear, I foresee a lot of problems with this approach, starting with the critical issue of defining the tunnels' capacity in a way that has enough capacity to pay the $16 billion tab and does not harm the water users who opt out. I will leave that analysis for a future post. For now, the Westlands/SEC situation shows why the WaterFix plan must stop dragging their feet and put forward a detailed financial plan and cost allocation now. It is critically important for that plan to demonstrate how the bond requirements will be satisfied in periods of drought when water agencies experience their greatest financial challenges, and that financing the tunnels will not jeopardize other investments in the California Water Action Plan. Paying the tunnel bonds' in a drought when water sales revenue is low will be a challenging even for wealthy urban agencies like Metropolitan and Santa Clara and it will be even more difficult if these urban districts have to stand behind the agricultural contractors who would be likely to miss payments in a drought. Environmental approvals for the WaterFix depend on the project maintaining its promise not to export more water in a drought, and various regulatory entities must require the WaterFix to demonstrate that its proposed operations are financially feasible during a drought. 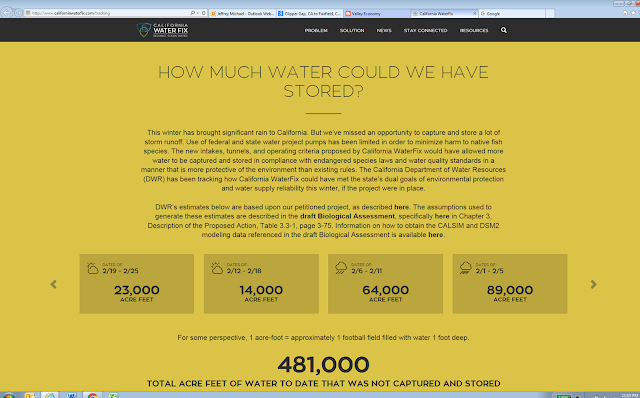 In January, the WaterFix website added a "tracking" page, concurrent with several news stories and commentaries that touted how much more water could have been exported and stored this winter if we only had the delta tunnels. Rather than track the change in water exports for the entire year, including negative times, to give a full picture of the tunnels' impact, they turned it on in January when conditions were extremely favorable for the tunnels. It will surely go away when the numbers are unfavorable later this year, and I doubt we will see any retroactive tracking to the drought. Using the WaterFix's technical documents that the tracking site references (see page 605), I made this simple table to show how they estimate water exports would vary over the course of a typical year with and without the Tunnels. (all values in acre feet, converted from cubic feet per second in original source, and show the difference in water exports with and without the tunnels). The tables show that the tunnels can result in less water exported during certain times and the typical annual total is only 225,432 acre feet - less than half the amount the tracking tool shows during the current favorable conditions this winter. 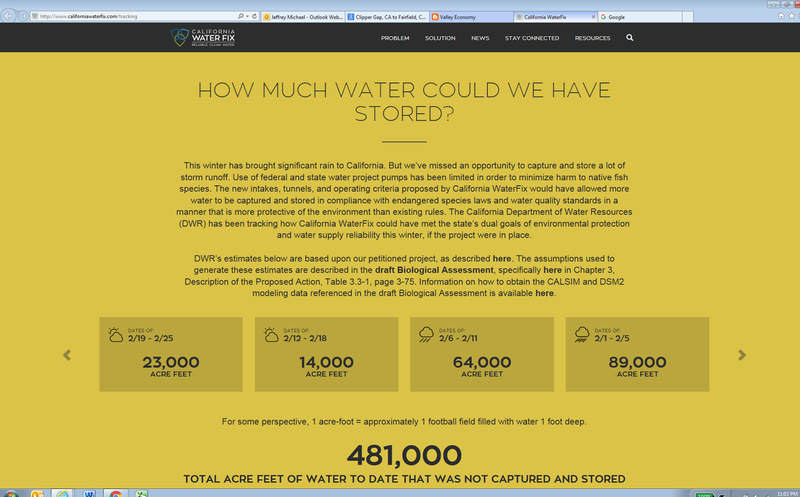 The tracking tool also makes a deceptive comparison to make it sound like a lot of water. They say enough water could have been stored this winter to serve 3.5 million people for a year. This is highly deceptive on two levels. First, they shouldn't make an annual water use comparison unless they are going to show the performance of the tracker over a full year - rather than just a few good months. Second, most of the water is exported to farms - not cities. Here is a more relevant comparison. The annual average yield of 225,000 acre feet is enough to irrigate 75,000 acres of California farmland. Yes, the main economic value of WaterFix to California is about 75,000 acres of south San Joaquin Valley farmland that would lose irrigation water. Using the average rental value of irrigated land in California, $400, or a typical agricultural water value of $100-150 per acre foot, that's about $30 million in annual water supply value. That isn't much compared to the tunnels enormous price tag. It appears that I am not the only one to notice this deceptive presentation, because I just noticed that WaterFix added the following disclaimer to their tracking website since I last visited about a week ago. Unbelievable. They create a website full of deceptive numbers with eye-catching graphics and giant bold numbers saying it will increase water diversions and storage, and then buried in a complex paragraph at the bottom of the page you find a sentence that says that the tunnels don't actually increase water supplies. This is what water ratepayers and future generations can expect from the state when it is time to pay back tens of billions of dollars for this boondoggle. "Despite our advertising that the tunnels increase water supply and storage, the fine print disclosed that the tunnels do not significantly increase water supply." Update 3/7: I forgot to link these comments by Doug Obegi about the tracking website in my original post. I focus on misleading ratepayers and farmers who will be stuck with the tab, but as Doug points out, this presentation is misleading environmentalists as well.